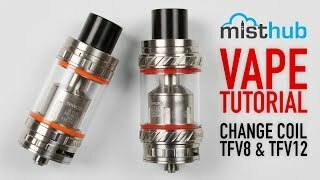 SMOK TFV8 Sub-Ohm Tank - more e-juice. More airflow. More flavor. More power. 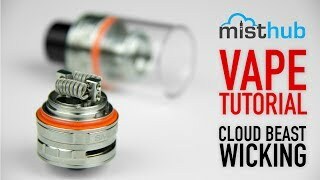 SmokTech promised greatness and the TFV8 Cloud Beast delivered. 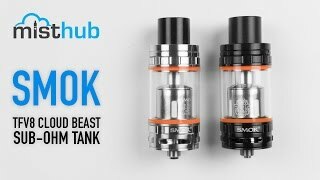 Smok’s newest sub-ohm tank is a Stainless Steel/Pyrex Glass constructed masterpiece and offers a massive 6.0mL fill capacity. The Cloud Beast sports a wide Delrin drip tip and two large adjustable air slots, dramatically increasing airflow in breathtaking fashion. 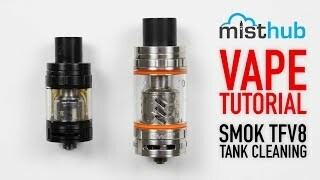 Similar to the TFV4 style, a locking/pivoting top cap sits on top of the tank, revealing a larger top-filling fill port and the massive chimney. The Cloud Beast TFV8 is shipped with 2 new patented coil designs; an Octuple coil head, and a Quadruple coil head (as well as a V8 RBA Head). The V8-T8 Octuple Coil head has a resistance of 0.15 ohms (50-260w) and reins supreme as Smok’s most powerful coil head. The V8-T6 Sextuple Coil head offers a resistance of 0.2 ohms and is rated between 50-240w. The 0.15 ohm V8-Q4 Coil head is Smok’s least powerful coil of the bunch and is still rated at 50-180w. A 2-post velocity style RBA head is included in this powerful batch of coils, catering to those who prefer to build their own coils. Smoktech crafted an incredibly powerful sub-ohm tank that cloud chasers dream of. 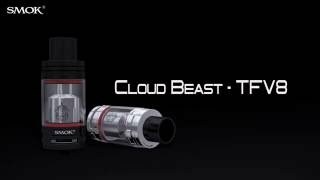 If you’re looking to take your cloud production to the next level, Smok’s all-new TFV8 Cloud Beast will not disappoint.